We are pleased to announce the release of our 3D MRF sequence and off-line reconstruction packages for fast quantitative imaging applications. 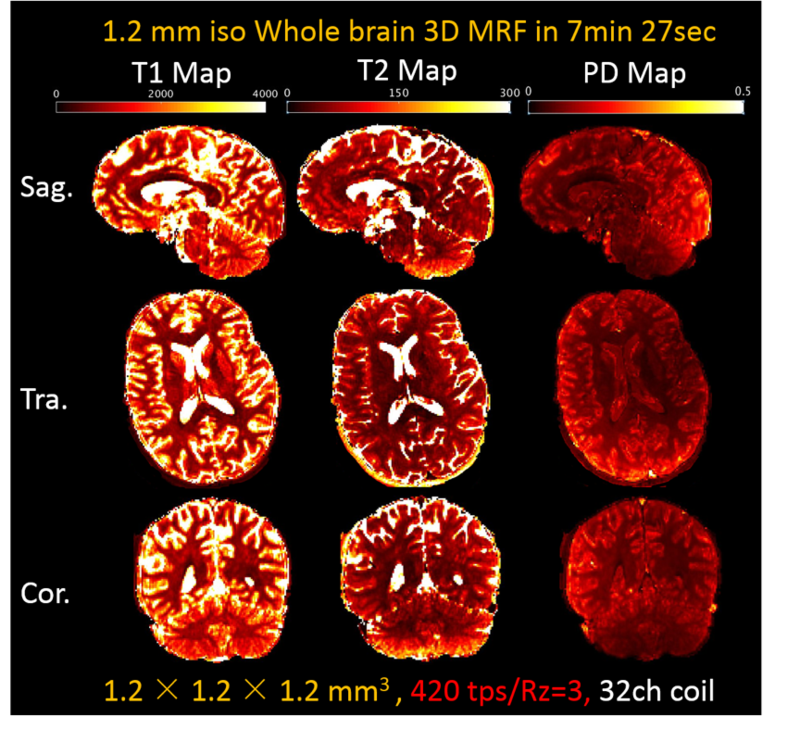 This package is developed by the research groups of Athinoula A. Martinos Center for Biomedical Imaging, Massachusetts General Hospital (MGH), MA, USA and Center for Brain Imaging Science and Technology (CBIST), Zhejiang University (ZJU), Zhejiang, China. Pulse sequence for 3D MRF is only available for the Siemens Prisma and Skyra Scanners with VE11A/C platforms. The off-line reconstruction script is based on MATLAB 2014b or later versions. 3.6-fold reduction in the number of TRs for pattern matching. 3D FISP sequence (9) was implemented for MRF. The partition-by-partition sampled sequence that also incorporates a low-flip-angle training data acquisition into the wait period. 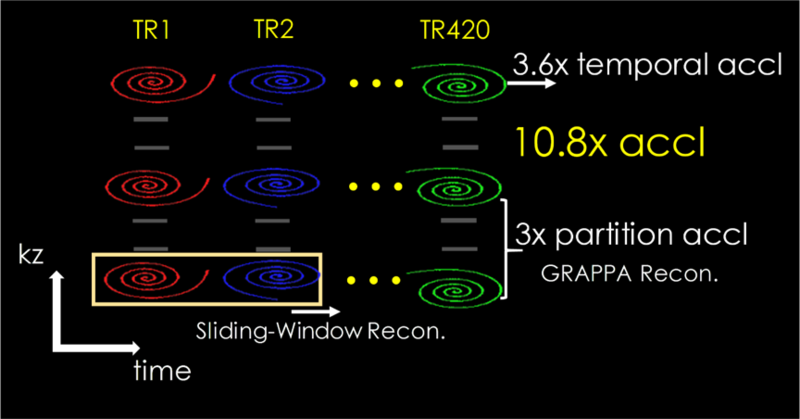 The total acquisition time for each partition is 8 seconds for a 420 time-points (tps) acquisition. 3D coil sensitivity profiles were estimated from the center fully-sampled k-space region of the training data using ESPIRiT (10-12). SW and NUFFT (13-15) were used to remove in-plane aliasing and create a Cartesian dataset that is fully sampled in-plane. This then allows for a direct application of Cartesian GRAPPA reconstruction to overcome Rz acceleration. More details can be found in (6). The dictionary was generated by 2-step extended phase graph (EPG) (16) simulation using variable TRs and FAs. The effect of the low-flip-angle GRAPPA training acquisitions and the T1 recovery during the waiting period between each partition were also included in the dictionary generation process. The SW+GRAPPA reconstructed 3D volumes were then normalized and pattern matched voxel-wise to the corresponding dictionary using the maximum inner product method to obtain T1 and T2 maps. Ma D, Gulani V, Seiberlich N, Liu K, Sunshine JL, Duerk JL, Griswold MA. Magnetic resonance fingerprinting. Nature 2013;495:187–192. Ma D, Hamilton J, Jiang Y, Seiberlich N, Griswold MA. 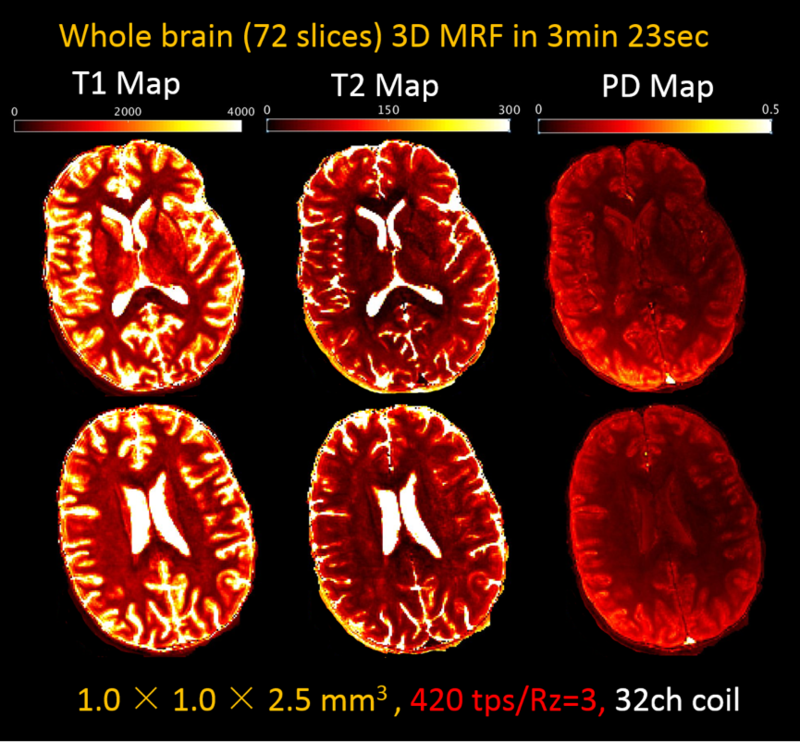 Fast 3D Magnetic Resonance Fingerprinting (MRF) for Whole Brain Coverage in Less Than 3 Minutes. In: Proceedings of the 24th Annual Meeting of ISMRM, Singapore. Singapore; 2016. p. 3180. Ma D, Pierre EY, Jiang Y, Schluchter MD, Setsompop K, Gulani V, Griswold MA. Music-based magnetic resonance fingerprinting to improve patient comfort during MRI examinations. Magn. Reson. Med. 2016;75:2303–2314. doi: 10.1002/mrm.25818. Buonincontri G, Sawiak SJ. MR fingerprinting with simultaneous B1 estimation. Magn. Reson. Med. 2016;76:1127–1135. doi: 10.1002/mrm.26009. Ma D, Jiang Y, Chen Y, McGivney D, Mehta B, Gulani V, Griswold M. Fast 3D magnetic resonance fingerprinting for a whole-brain coverage. Magn. Reson. Med. 2017. doi: 10.1002/mrm.26886. Liao C, Bilgic B, Manhard MK, Zhao B, Cao X, Zhong J, Wald LL, Setsompop K. 3D MR fingerprinting with accelerated stack-of-spirals and hybrid sliding-window and GRAPPA reconstruction. 2017. doi: 10.1016/j.neuroimage.2017.08.030. Cao X, Liao C, Wang Z, Chen Y, Ye H, He H, Zhong J. Robust sliding-window reconstruction for Accelerating the acquisition of MR fingerprinting. Magn. Reson. Med. 2016. doi: 10.1002/mrm.26521. Griswold MA, Jakob PM, Heidemann RM, Nittka M, Jellus V, Wang J, Kiefer B, Haase A. Generalized autocalibrating partially parallel acquisitions (GRAPPA). Magn. Reson. Med. 2002;47:1202–1210. doi: 10.1002/mrm.10171. Jiang Y, Ma D, Seiberlich N, Gulani V, Griswold MA. MR fingerprinting using fast imaging with steady state precession (FISP) with spiral readout. Magn. Reson. Med. 2015;74:1621–1631. doi: 10.1002/mrm.25559. Uecker M, Lai P, Murphy MJ, Virtue P, Elad M, Pauly JM, Vasanawala SS, Lustig M. ESPIRiT - An eigenvalue approach to autocalibrating parallel MRI: Where SENSE meets GRAPPA. Magn. Reson. Med. 2014;71:990–1001. doi: 10.1002/mrm.24751. Uecker M, Ong F, Tamir JI, Bahri D, Virtue P, Cheng JY, Zhang T, Lustig M. Berkeley advanced reconstruction toolbox. In: Proc. Intl. Soc. Mag. Reson. Med. Vol. 23. ; 2015. p. 2486. Fessler JA. On NUFFT-based gridding for non-Cartesian MRI. J. Magn. Reson. 2007;188:191–195. Weigel M. Extended phase graphs: Dephasing, RF pulses, and echoes‐pure and simple. J. Magn. Reson. Imaging 2015;41:266–295. Thanks to Congyu Liao (MGH/ZJU), Berkin Bilgic (MGH), Mary Kate Manhard (MGH), Xiaozhi Cao (ZJU), Bo Zhao (MGH), Jianhui Zhong (ZJU), Lawrence L Wald (MGH), and Kawin Setsompop (MGH) for their efforts in developing this software.